Medical Laboratory Science (also called Clinical Laboratory Science) is one of the most under-recognized health professions – with excellent job prospects. What is a Medical Laboratory Professional? Medical Laboratory Scientists (MLS) and Medical Laboratory Technicians (MLT) — also known as Clinical Laboratory Scientists (CLS) — perform laboratory tests on patient samples to provide information needed to diagnose or monitor treatment. Examples of common laboratory tests include tests to detect anemia, diagnose diabetes and strep throat, and provide a transfusion to an accident victim. Biological Safety Levels (BSL) are a series of protections relegated to the activities that take place in particular biological labs. They are individual safeguards designed to protect laboratory personnel, as well as the surrounding environment and community. These levels, which are ranked from one to four, are selected based on the agents or organisms that are being researched or worked on in any given laboratory setting. For example, a basic lab setting specializing in the research of nonlethal agents that pose a minimal potential threat to lab workers and the environment are generally considered BSL-1—the lowest biosafety lab level. 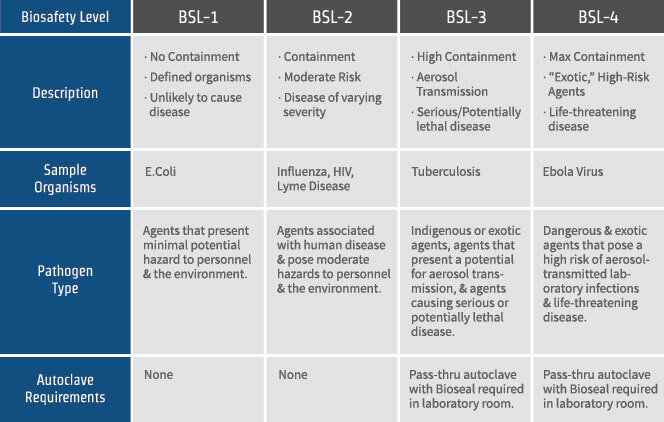 A specialized research laboratory that deals with potentially deadly infectious agents like Ebola would be designated as BSL-4—the highest and most stringent level. The reason biosafety levels are so important is because they dictate the type of work practices that are allowed to take place in a lab setting. They also heavily influence the overall design of the facility in question, as well as the type of specialized safety equipment used within it. https://i0.wp.com/www.kpjlablink.com/wp-content/uploads/2016/06/IMG_4699.jpg?fit=3648%2C5472&ssl=1 5472 3648 kladmin http://www.kpjlablink.com/wp-content/uploads/2015/12/lablink.png kladmin2016-06-27 04:37:342016-08-25 03:34:56What is Bio-Safety Laboratory?